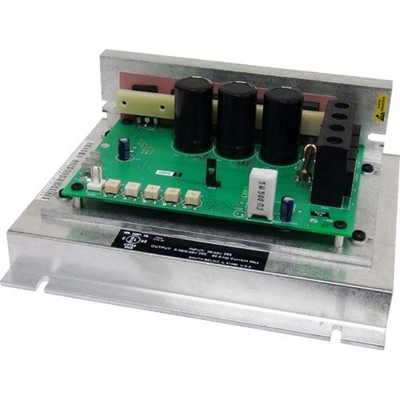 The DC60-12/24 PWM drive was designed for applications running from a DC power supply or DC battery power. This drive provides continuous current ratings and higher bus capacitance (to better handle ripple currents) than competitive units. The DC60-12/24 is ideal for many types of portable equipment, especially battery-powered equipment due to its ability to maintain variable speed control as the battery discharges. This results in an overall increase in running time of the equipment. With a 150% overload capacity, an inhibit function for remote starting and stopping, a power LED and non-interactive trimmer pots, the DC60-12/24DC stands out among the many DC input drive options. Low voltage motor operation: Designed for 12, 24, 36 and 48VDC motors. Speed range and regulation: 1% regulation over 80:1 speed range. User adjustable calibration pots: IR compensation, max speed, min speed, acceleration and current limit. Diagnostic LEDs: Power.Stopping modes: The user can coast the motor to a stop (N.O.). Spade terminals and screw terminal block: Quick and easy connections. DC input voltage: Accepts DC input and outputs DC voltage up to 95% of the input with near perfect form factor. One drive for two motor voltages: On board jumper to select 12 or 24VDC motor (36 or 48VDC on some models). Additional features: Inhibit terminals (P/N 201-0024 for plug assembly), extruded chassis and non-interactive trimmer pots.